“The financial market has a key role to play in creating economic drivers that contribute to a sustainability shift. The better we are at this, the faster the transformation will take place.” These are the words of Karl-Oskar Olming, who in August assumed the position as Chief Sustainability Strategist at SEB. What attracted you to SEB? Karl-Oskar Olming received his education at the Stockholm School of Economics, where he specialised in international economics. After spending a few years as a consultant, he accepted a position with the ILO (International Labour Organisation), a UN body that brings together governments, employer organisations and labour unions from around the world. He was stationed in Sri Lanka, Geneva and the Caribbean. 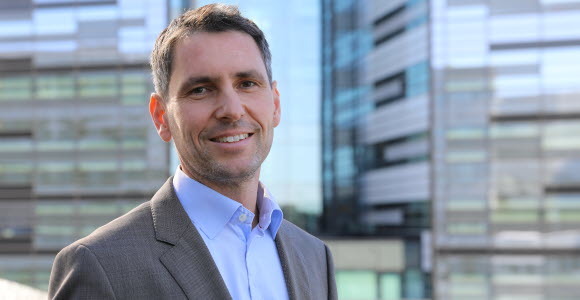 In 2009 Karl-Oskar began working at Exportkreditnämnden (EKN) as Head of CSR and Deputy Director Risk Advisory, where he built up EKN’s work with sustainability to become one of three primary risk parameters aside from country and credit risks. During the last three years he was EKN’s Africa Representative with focus on sustainability and business development. In June he moved back to Sweden with his family. What is the most important thing that the banking and financial sector can achieve? “As a bank we have great power to drive development by virtue of our lending and investment advice, where we can influence companies towards greater responsibility and sustainability,” he says. “It is therefore of central importance that we integrate sustainability in all of our operations. We need to be better at managing social and environmental risks in our services and products. What is the most important sustainability issue right now? “Globally it is without a doubt climate change. It is at the core of everything and is ultimately a matter of our survival. And also that the business sector has a key role to play – that enterprise, entrepreneurship and innovation will be crucial in bringing about serious change. “But we also need to be even better at offering products that contribute to sustainable solutions. For example, SEB was a forerunner when it created the first green bond in 2008 together with the World Bank. Today this has grown into a global, billion dollar industry that is helping steer steady financial flows to climate action.